Home >> Exteriors >> Roof Designs >> Rafters vs Trusses – Know the Differences between those Structures! If you are about to construct a home, the key deliberation – besides foundation – to think about is none other than structures that support your roof. As it happens, the decision will end up in two possibilities. They might be either rafters or trusses. In the past, rafters were popular in the housing industry. Unlike the old time, today seems that both methods are nothing yet perfect. There must be either advantages or disadvantages to them. Hence, get the details of rafters vs trusses. Rafters are elongated planks of which size – normally – is around 2 x 10s or 2 x12s. They normally incline from a spot named central ridge beam and meet an intersection with the outer walls. The role of the lengthy planks is highly vital to hold up the roofing as well as roof sheathing. The method used to involve rafters is recognized as stick framing. 2. What are the Trusses? Trusses are a prefabricated structure mostly made of wood. Eventually, they form triangle-based webbing whose function is to support the roof. Trusses play a significant role during the process of tying with the outside walls. They stand along with chords (sloping beams that expand to the peak of the truss). The ties and beams in the webbing come with an objective to distribute the load of the roof along the broad area. Unlike rafters setting up on site, trusses usually are produced in a factory. 3. What is the Difference between Rafters and Trusses? It’s time to make a comparison between rafter vs truss. Let’s begin with the benefit of rafter itself. First, rafter is in line with your initial scheme turning an attic into an additional room. It provides a larger space that you can use it as storage. Rafter construction also offers attic insulation functioning as a radiant barrier. The interesting fact is that it provides a wide range of ceiling options cathedral to vaulted style. Moreover, it complies with your construction plan as it has been carefully designed on site before. How about the drawback of a rafter? Regarding timing, rafter seems to take much time so that the construction processing becomes slower. It also involves more professionals to finish the roofing project. It will be more time-consuming if the house has a substantial rafter roof. As it encompasses many laborers, the price, unfortunately, is costing the earth. To create an incredible creation, you need to hire skilled people to do this. It means that rafter doesn’t allow you to go with DIY thing. Speaking of the truss, it has some advantages that you need to take into consideration while deciding the best one. Compared to rafter, truss product is excellent when it comes to quality control. It is designed automatically according to a computer setting. You might expect that the quality control is steady and yes, it does. The finishing time of truss project is precise, and the delivery is in time. What’s more, it’s resistant to any weather exposure. Preferring this is, of course, not harm. Unlike the residential project of rafter involving many individuals to finish it, truss has an exception. You know what; the construction is way faster than the early pick. It only takes one to two days to let everything look perfect. To get you convinced, we provide you with another attention-grabbing fact, i.e. its strength which is greater than a rafter. This sort of feature can’t be apart from the composition of the truss – ties and beams. Those who compare trusses vs. rafters cost, you will find that trusses, as a matter of course, way cheaper. It diminishes cumulative costs reaching 16 percent. Aside from advantages, the truss has cons that you need to give some attention. The first drawback is that trusses don’t give you a chance to have an extra room. In other words, it reduces your attic space. As they are manufactured in a factory, there must be a delivery system that uses a big truck with 18 wheels. For sure, you need to make sure that your site is large enough to occupy the vehicle. It could be something problematic unless you have a large road. Additionally, it appears to be bulky making the weight that heavy. Transferring from a truck to the top of your house can’t be carried out people. Moreover, you must let a crane do it for you. Yes, the price of the final product of trusses is relatively lower than a rafter. However, the front cost is not that competitive as you think. The initial cost of product fabricating is higher than the raw material that is the lumber. Another negative side of trusses is that it goes with less flexibility once you plan to change. It’s almost impossible to re-design when you change your mind. If it’s doable, the cost you will spend for the alteration surely is not like a small amount. 4. Which One is Better in Truss vs. Rafter for a Remote Project? In the name of practicality, rafter is in line with that. Although it takes more time in finishing, your project will never find a serious matter. To put it in a nutshell, the great barrier for trusses is basically how to carry away the object. As stated previously, it requires an 18-wheel truck that’s impossible to run in a remote place. 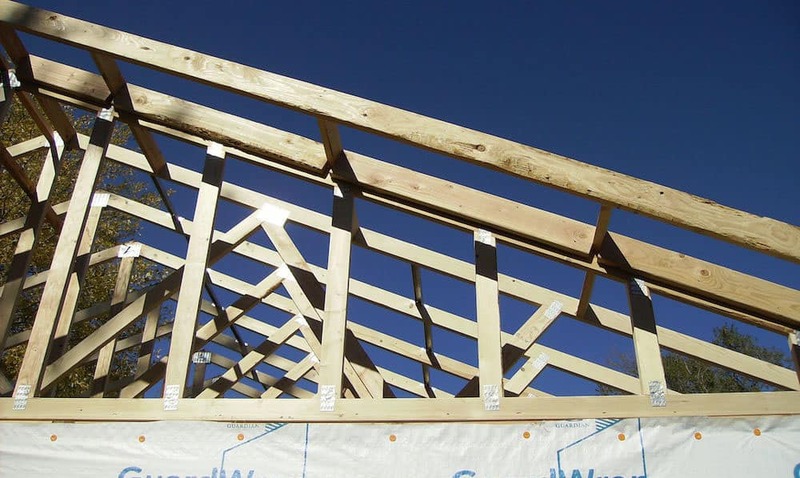 The geographical condition will hamper your roof truss construction. 5. Is There Any Difference for Overall Quality of Both? By and large, both rafters and trusses go with similar qualities. In spite of the drawbacks of both, the structures have their unique strength. Yes, the processing might be different, but the final result is the same – even, at a glance, the look shares an affinity. The slight dissimilarity is simply on the price—as we know that roof truss prices are less high. Last but not least, the point of rafters vs trusses is to figure out the strength and weakness of both structures. Regardless of your final decision, knowing their facts is very important. That is nice that the finishing time of a truss is precise. That is something I would want to have if I was having a home built. Maybe it would be good to get a truss for the home.